Because competition for donor dollars in November and December is so fierce, the success of your end-of-year fundraising campaign depends as much on how and where you spread your message as on what the message is. Let’s dive into each of these a little further. Still the cornerstone of digital fundraising, emails at the end of the year take on a special urgency. Q: How many fundraising emails should you send at the end of the year? Yep, that struck me as a big number, too. But the research proves it: You need to send at least 8 emails to your donors at the end of the year (source, source). Sure, each email will produce some unsubscribers. But they’re far outweighed by the donations you’ll earn, and the lost subscriptions were people who clearly weren’t very invested in your mission. At Mighty Citizen, we recommend launching your end-of-year email fundraising campaign on Giving Tuesday—this year on November 27, just five days after Thanksgiving and one day after Internet shopping holiday Black Monday. Whether or not you wet the whistles of your donors with some pre-Giving Tuesday emails, you’ll at least want to make a big deal of the Tuesday itself. Send about one email per week after Giving Tuesday. Make every email count. Invest time in crafting a compelling message worded just so. Each email should have a bold call-to-action and a clear link to donate. Reflect on what worked in years past, but also don’t be afraid to use your email software to do some testing on subject lines, content, personalization, etc. Nonprofit marketing is a nonstop exercise in refinement and targeting—and the end of the year is prime data-gathering time. Your website should already be the most efficient member of your development staff. It never sleeps, never takes a paycheck, and never hogs the cream cheese in the breakroom. But at the end of the year, your website needs some special attention. When your EOY campaign launches, you need either (a) new webpage content that reinforces and expands upon your campaign concept, or (b) a unique landing page on your website for the EOY campaign. While for major donors, tax deductions are a real financial concern—the reason you can most easily tap into is #1. The vast majority of individual donors make their gifts during the holidays because the notions of “charity” and “selflessness” and “community” are heightened. So, don’t be afraid to acknowledge the “holiday-ness” of your ask—just as charity:water has so artfully done above. Whatever messaging and design concept is fueling your EOY campaign, let it nuzzle its way into your entire website’s content. Make your users feel like they’re participating in something special, thoughtful, and intentional. We’ve been talking about online donation forms for nearly two decades—and still, so many remain confusing, daunting, not secure, and ugly. If you do nothing else for your EOY campaign, spend some time in August and September auditing your online donation process. How can it be made better? If your website isn’t mobile-responsive, stop reading this article and go hire a web designer to make it so. But assuming your site is already mobile-responsive, you also need to keep an eye on your EOY campaign’s mobile-friendliness. This is especially important if your campaign is directing users to a microsite or landing page. In other words, all of your emails should also be mobile-responsive. Does it Emphasize Monthly Recurring Donations? You’d rather have a monthly donor than a one-time donor, of course. So what are you doing to encourage it online? Here, some DIY usability testing may help—i.e., asking friends and family to hop onto your website and attempt to create a monthly recurring donation. They’re not actually doing it; you’re just going to observe them as they go through the process on their own. Where do they get stuck or slow down? Do they get confused and click around randomly? Throughout the donation process, “Monthly” is there as a not-so-subtle-but-not-obnoxious reminder. The “Thank you for donating!” page is just as important as your campaign because, while thanking your donors is obviously the right thing to do, it’s also your first opportunity to begin nurturing their next gift. The page should be celebratory! Your donors never feel better than in the moments after submitting their gift. Make it bright! Emphasize what’s just happened: YOU MADE A DIFFERENCE JUST NOW! And then give your freshly minted donors easy ways to keep going. What other pages on your site would they like to check out? What pictures should they look at? Which stories should they read now? What event could they attend? You can also use this page to collect some additional data. The donation form itself should be as simple as legally/financially required in order to make the process as quick and easy as possible. You don’t want to fill the form with unnecessary questions, but your thank-you page can do some of that data-gathering for you. Ask them which of your programs they care about most, why they gave, their age, etc. Whatever you’d like to know—(because it can be used to help future fundraising efforts)—ask it here. Oh, our old friend! Direct mail is at a bit of a crossroads, and it’s unclear which direction it’s headed in the next few years. We know that overall direct mail contributions have declined in recent years. And at scale, direct mail is the most costly communication channel. But done well, it can deliver an impressive ROI. And according to most reports, offline giving—i.e., anything not on the web—still accounts for approximately 90 percent of all charitable giving. As with all content, direct mail is most effective when it both stands out and connects to your mission. Between Thanksgiving and New Years, donors may receive hundreds of pieces of fundraising content in their mailboxes—especially from the huge international nonprofits whose direct mail budgets would make your jaw drop. The most effective direct mail campaigns are integrated with email and your website. Consistency is key. If you’re looking for a way to save money, consider only sending direct mail to those who respond via direct mail. Donors who typically give online would not receive a full direct mail appeal or might only receive a postcard. Send a smaller appeal to ongoing existing donors instead of a large direct mailer to test results. If budget allows and your direct mail response is strong, send more than one piece of mail. First of all, don’t turn your social media presence into a nonstop fundraising campaign at the end of the year. Continue to curate, create, and share content that isn’t pure “ask.” By publishing content to social every day (including weekends) you’ll get a clear sense of when and what most engages your audiences. Focus your social content on your successes and your supporters. Purpose and people, that’s what proves to be most shareworthy. Use images and video. Also consider tapping into any urgent or topical public awareness news that is relevant to your mission. This is not the time to introduce a new social media channel. It’ll be difficult to build a strong enough channel following in such a short period of time to truly be effective. Do one or two platforms really well before adding a third (after the new year). Quick Note About Peer-to-Peer Donations: Social media offers a great way to dip your toe into more peer-to-peer fundraising—especially Facebook Fundraisers. It’s the perfect opportunity to get board members, volunteers, and other supporters involved to help raise money at this important time of year. Online advertising still works—especially for nonprofit organizations. And while online advertising isn’t foundational for your communication mix, you may considering adding some this year. Search ads (also called “pay-per-click ads”) are paid online text advertising. They appear as the paid results at the top of internet searches. If your nonprofit organization utilizes Google Ad Grants, those are search ads. During your end-of-year campaign, these ads can be used to solicit donations. Image ads are paid online image advertising (also called “banner” or “display” ads). You can choose to have these displayed only to users in a certain geographic region, of a certain demographic, or based on their past searches. You’ve definitely seen retargeting ads. Retargeting ads display only to those who have already visited a website but have not taken action (yet!). 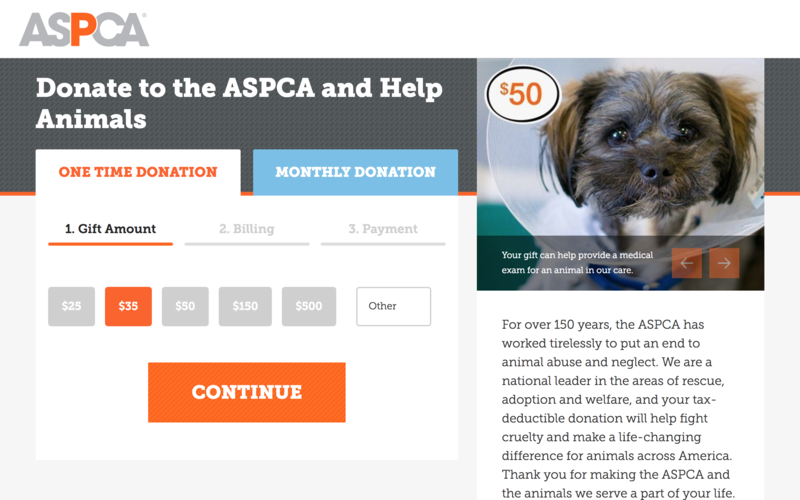 For example: I visited the The Humane Society’s website but didn’t make a donation (yet!). Later, an ad for The Humane Society appeared while browsing the website of a local news outlet. Because viewers have already shown interest in your organization by visiting your website, retargeting often produces better results than other image ads. For your end-of-year campaign, you’ll want the ads to point back to your donation page or you may make a special landing page just for them. Television ads. Radio ads. Bus wraps. Billboards. And so on. For larger organizations, this can be worth the investment because these channels aren’t commonly used for charitable ads. For end-of-year campaigns, these are best used as awareness builders—getting people thinking of your organization as you build up to your end-of-year ask. So out-of-home advertising should launch earlier than typical campaigns—usually in September or October. Like with any recipe, adjust and modify our suggested mix to fit your organization’s strategy and needs. Turning your end-of-year message into action is no easy feat, but with the right communication channels you can find greater success this holiday season. Whether your organization already runs a robust EOY program, you’re starting from scratch, or looking to try something new, make sure to maximize the most generous time of the year.